Any time of year, I crave comfort food – soup, pasta, all the carby goodness and it’s particularly true in the winter months. That’s when this easy chicken noodle soup recipe hits the spot. I’d say it’s like grandma’s chicken soup only better! The key to this quick and easy chicken noodle soup is that the veggies should be chopped not too thick, not too thin….think of the story of Goldilocks and the Three Bears, lol. This soup comes together rather quickly and if they are too large, it will slow down the cooking process. The great thing here is that the chicken used is from a store-bought rotisserie chicken. If you want to roast your own chicken instead, go for it! Leftover turkey works wonderfully here too. Portion up a big bowl and enjoy! Do I Add Cooked or Uncooked Noodles to Soup? What’s the Best Noodle for Soup? I add uncooked noodles to this chicken soup. They take minutes to cook and there’s lots of liquid in there for them to cook evenly. Plus, it saves me from using more than one pot, which is never a bad thing if you ask me! If, however, you want to cook the noodles on their own and then add when serving, that’s a-ok too. For classic chicken noodle soup, I love to use egg noodles. They’re substantial and hold up well when reheating. How Can I Spice Up Chicken Noodle Soup? I love using fresh herbs, especially in the summer when we can grow them in our garden. This time of year, though, to the grocery store it is. For some reason, growing them in the house, just don’t work for me – I have way better luck growing them outside. Anywho…the fresh dill here really adds a lovely savoury flavour. If you don’t have fresh dill handy, just use one third the amount of dried dill. If you’re using freshly prepared chicken, chicken soup will last 3-4 days covered in the refrigerator. It may thicken as it cools because the noodles may absorb some stock. No worries! Just add a little more stock upon reheating to loosen. Can I Freeze Chicken Noodle Soup? Indeed you can! Just portion cooled soup into vacuum seal bags, seal and lay flat to freeze. If you don’t’ have a vacuum sealer, portion into freezer safe bags or tubs. Thaw when ready to enjoy. What Goes with Chicken Noodle Soup? 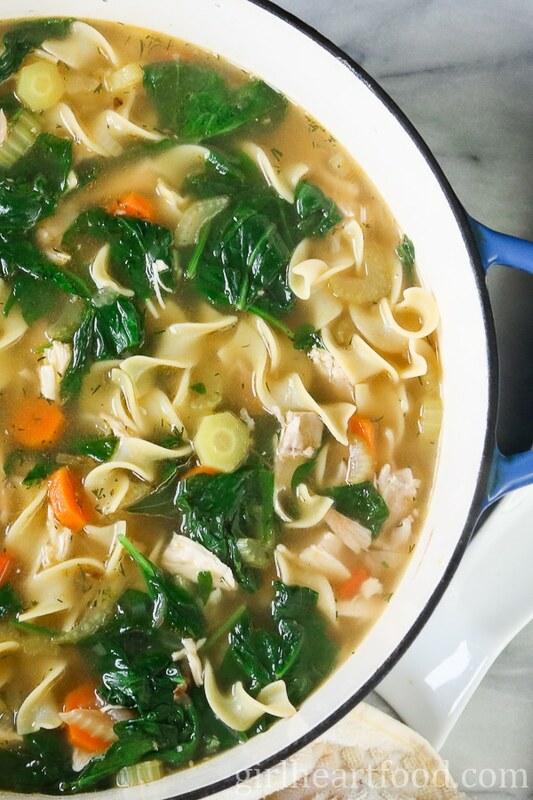 This unique chicken noodle soup is finished with some baby spinach for an extra kick of nutrition. And who doesn’t want that in the colder months of winter?? The recipe makes a big pot of soup but, trust me, it will disappear fast!! This is the best chicken noodle soup if you ask me 😉 Hope you love it as as I do. Until next time, take care and chit chat again soon! There is nothing more comforting than a big bowl of Homemade Chicken Noodle Soup. 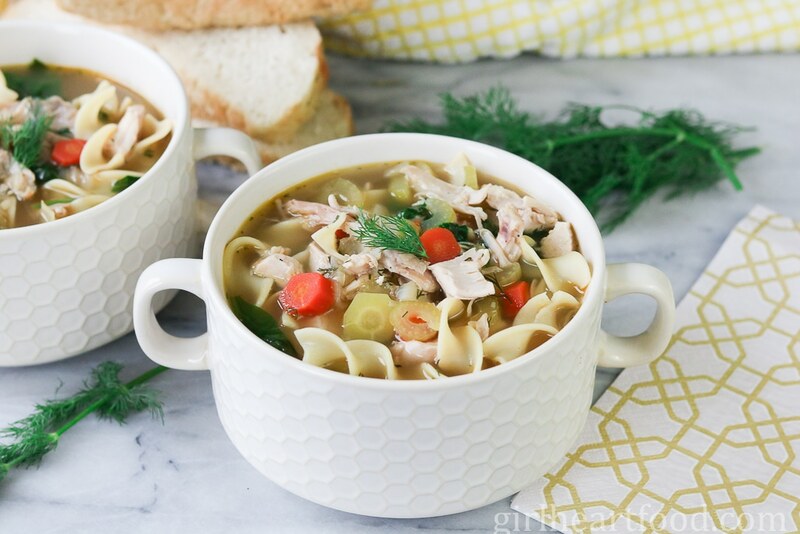 The flavourful dill infused broth with chunks of chicken, veggies and egg noodles make for one belly warming bite. This one is sure to be a favourite in your home as it is ours! In a large pot on medium low heat, add olive oil. Cook onion until translucent, about 5 minutes. Add garlic and cook an additional minute. To pot, add carrot and celery and cook 1-2 minutes, stirring to combine. Stir in salt, pepper and bay leaves. Add dill and stock to pot. Bring to low simmer, cover and cook about 10 minutes or so until carrot and celery not quite tender, but almost. Add egg noodles and chicken to pot and cook, covered, for an additional 10 minutes (the last two minutes add spinach and stir to combine). Serve immediately and garnish with extra dill (if desired). Remove and discard bay leaves. Enjoy! I really like the idea of adding spinach to this traditional soup. Adding in some extra health benefits is a plus! Such a classic recipe and of course an all time favorite in our house! This looks absolutely perfect! Ours too 🙂 Thank you Lisa! I never tire of soups and this chicken noodle looks like it calling my name! I like the addition of dill in this recipe. Such a great herb, one of my favorites. Thank you Zuzana 🙂 It’s quite tasty! Chicken noodle soup is the ultimate pick me up and we always make it when someone in our house is sick. This looks lovely.